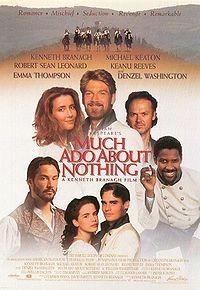 Much Ado About Nothing is a 1993 film based on William Shakespeare's play. It was adapted for the screen and directed by Kenneth Branagh, who also played the role of Benedick. Much Ado About Nothing was released on May 7, 1993, reaching 200 U.S. screens at its widest release. It earned $22 million at the U.S. box office and $36 million total worldwide, which, despite failing to reach the mark set by Franco Zeffirelli's Romeo and Juliet, made it one of the most financially successful Shakespeare films ever released. It was also entered into the 1993 Cannes Film Festival.